- Publisher The release of the major movie "The Da Vinci Code" on May 19 is certain to ignite a hotbed of intense interest and discussion on the truth of the Christian faith. In this informative, seven-session group study, well-known theologian and Bible teacher Dr. Erwin Lutzer examines the claims behind "The Da Vinci Code" and instructs on true history and how to defend the faith. Through dynamic video segments, intriguing talking points, and stimulating breakout sessions to support their reading of "The Da Vinci Deception," participants will gain a new understanding of the issues presented as well as the historical basis of early Christianity. The pack includes one copy of "The Da Vinci Deception" mass market book, a DVD-ROM, and Leader's Guide with reproducible handouts. Great for small group study, Sunday School, or whole church events. About "The Da Vinci Deception Experience"
The release of the major movie "The Da Vinci Code" on May 19 is certain to ignite a hotbed of intense interest and discussion on the truth of the Christian faith. 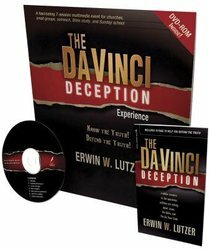 In this informative, seven-session group study, well-known theologian and Bible teacher Dr. Erwin Lutzer examines the claims behind "The Da Vinci Code" and instructs on true history and how to defend the faith. Through dynamic video segments, intriguing talking points, and stimulating breakout sessions to support their reading of "The Da Vinci Deception," participants will gain a new understanding of the issues presented as well as the historical basis of early Christianity. The pack includes one copy of "The Da Vinci Deception" mass market book, a DVD-ROM, and Leader's Guide with reproducible handouts. Great for small group study, Sunday School, or whole church events.